Many banks and NBFCs offer a personal loan to individuals and businesses including the ICICI Bank. The loan can be used to meet any personal expense which can include weddings, education, home renovation, holiday, to top-up an existing loan, buying an electronic gadget and more. Like every other loan, a personal loan is paid back in equated monthly installments or EMIs over a fixed loan term. One of the most efficient methods of calculating EMI and interest rate is by using the ICICI Personal Loan calculator. The ICICI personal loan EMI calculator in India takes in inputs from the user and calculates EMI the borrower is expected to pay every month. It then displays other information such as Amortization details along with the EMI. The principal amount, interest and tenor are the three main components of your personal loan EMI. Many factors are affecting EMI and consequently, the results of the ICICI EMI calculator. 1. Principal Amount – The amount of money taken from the bank to meet a personal expenditure is known as the principal amount. A higher amount translates into a higher EMI. 2. Interest Rate – The interest charged by the bank for lending the principal amount to the borrower is known as the rate of interest. You can use the ICICI personal loan interest rate calculator for greater accuracy. 3. CIBIL Score – It is a credit score given by the Credit Information Bureau (India) Limited. It indicates the creditworthiness of the borrower. A low score can lead to rejection of a loan application. 4. Loan Term– The personal loan is extended for a certain time which is the loan term. It is usually calculated in months. The tenor of a personal loan ranges from 12-60 months. Other factors such as the category of the borrower, customer’s age group, and income tax slabs also affect the EMI and thus the results of the ICICI Bank calculator. 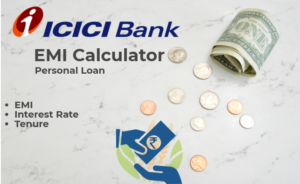 The ICICI Bank Personal Loan EMI Calculator is a very advantageous tool which helps you know the installment the borrower has to pay every month. Here are the major benefits of the tool. All you have to do is input the details and the calculations will be done for you. With the ICICI personal loan EMI calculator, you can do all the calculations without any help. Change the principal amount and tenor as many times as you want to calculate the EMIs. Continue using the tool until comfortable with the repayment amount. There is no need to register with the bank or make a payment to use the tool. The free tool can be used as multiple times without incurring any charges. The tool is easily accessible on all devices including computers, laptops, and smartphones – Android, iOS and tablets. Use it anytime, from anywhere. The ICICI Bank personal loan calculator is a tool that is designed to help you easily calculate the EMI amount. The sliders on the left side can be adjusted, while the right side will show the Amortization table. The table will show Balance of Total Outstanding, your monthly EMI and total interest payable. The ICICI stands for Industrial Credit and Investment Corporation of India. The ICICI is a multinational bank offering banking products and financial services to customers, both corporate and retail. Why should I use the online calculator? Using the ICICI Bank personal loan EMI calculator online is easy and convenient. You should use it to get an idea of the amount of money you will be liable to pay every month before you approach the bank. Are the EMI calculations accurate? The EMI calculations are accurate. But, they will not be the exact amount you will pay to the bank as repayment. It is an indication of the financial expense you will incur for the loan term. A bank representative calculates this exact amount. What is a good CIBIL Score? The CIBIL score is a score with a maximum limit of 900. It takes into account several parameters including income, prepayment of other loans, rejection of loan applications, etc. A score above 750 by banks and 650 by NBFCs is considered good while applying for a personal loan. Does my income affect my loan application? Yes, the higher the income the higher are the chances of getting the loan. A salaried person, who has worked continuously for one company for three years is more likely to get approval. Businesses will have to submit income details to avail the loan. The monthly repayment amount which pays back both the principal and interest over a fixed tenor. This is the amount the bank will extend to you as a loan. The amount is subject to the bank’s discretion. The interest that the bank will charge for extending a loan to the borrower. It is charged on per annum basis. If the loan is paid before the loan term ends. The bank will charge a fee for loan prepayment. You can repay the whole loan amount or a partial principal amount. You can make use of the ICICI Bank personal loan preclosure calculator to know the details. The fees charged by the bank for processing your loan application. The fees may be charged even for applications that get rejected. The fee is charged if you miss paying your monthly EMI. The interest rates can be modified or updated by the ICICI Bank on a regular basis. So, you should visit the fees and charges pages, before using the ICICI EMI Calculator for personal loans. Extra interest on late payment of fee: 24% p.a. Interest rate: 10.99% p.a. to 22% p.a. A personal loan can help you meet expenses without causing financial stress. However, it is necessary to take a loan you can pay back in easy installments. Use the ICICI personal loan EMI calculator multiple times to calculate and choose the amount and loan term, which makes the repayment hassle-free.